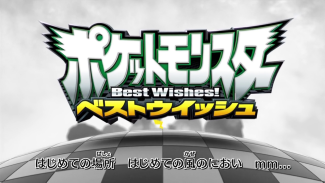 Japanese Opening Theme BW 01: "Best Wishes!" 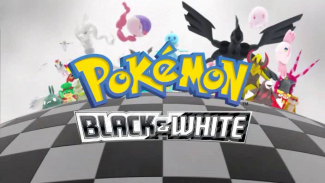 American Equivalent(s): "Black & White"
Used in Japanese Episodes: BW 001 - BW ??? 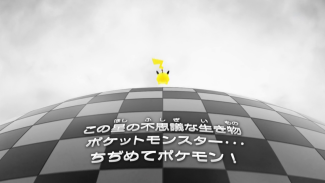 Pikachu is seen running along a small planet covered in a black and white checkered pattern. 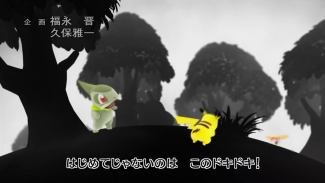 After the show's logo appears, the electric pokemon jumps to a second planet covered with trees. It continues running, going past a Minezumi, Hiyapp, Baopp, Kibago, Charbu, and Shikikija. 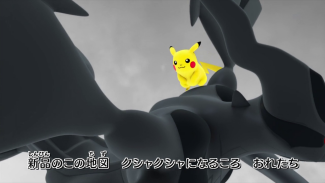 Next, we see Pikachu running on the body an enormous Zekrom. 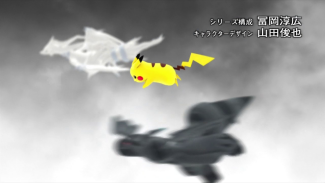 Pikachu runs up to Zekrom's shoulders and then jumps toward a nearby Reshiram. It slides down the legendary pokemon's mane and bounces off its tail, propelling itself into the air. 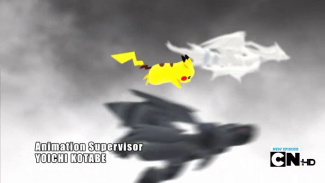 It then shares a brief flight with the two legendary pokemon. Next, Pikachu lands on a city-type planet. 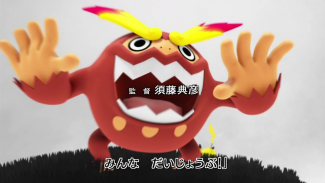 It passes a Chillarmy, Meguroc, Yabukuron, Tabun'ne, and Ishizumai as it runs toward an open doorway. This path then opens up to a series of rooftops. 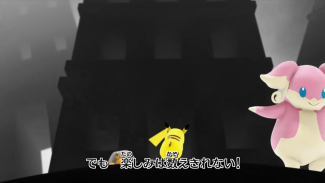 Pikachu jumps from rooftop to rooftop, passing a Mun'na on the way. Next, Pikachu is seen walking along a water-themed planet. 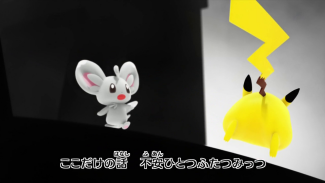 A Hatohboh, Futachimaru, and Mamanbou appear in the background while Pikachu waves to a Pokabu, Tsutarja, and Mijumaru. After it greets the starter pokemon, Pikachu takes off running again, this time on a grassy planet. 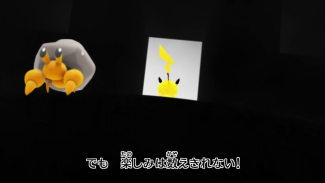 After it passes by an Ononokusu, Janovy, Koromori, Darumakka, and Hihidaruma, the black and white tiles below Pikachu begin to come apart. 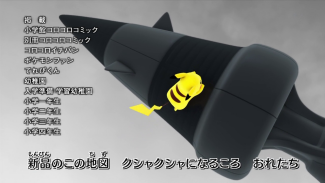 The pieces of the planet float weightlessly through the air, sending Pikachu and the other pokemon into a slow free fall. The planet's pieces eventually reassemble themselves, enabling Pikachu and all the pokemon it had met so far to gather together and pose for one final group shot. I noticed something recently when it comes to the Diamond & Pearl openings; I didn't really love any of them. I liked the animation that went with them alright, but the songs never really clicked with me. It took me a really long time to warm up to Together, and I was pretty "meh" toward High Touch and Saikoh Everyday! When I took a look back at the openings I do consider my favorites, I found a common pattern; they were all sung by Matsumoto Rika. I didn't realize it until then, but we had gone the entirety of Diamond & Pearl without a solo Matsumoto Rika song. Luckily, the drought is over. Best Wishes! brings Satoshi's voice actress back as the sole performer of the show's opening theme song, and it was worth the wait. The singer shows that she still has it as she gives an energetic performance that really gets you hyped up for the show. I was able to catch a taped performance she did of the song at one of those pokemon festival things, and the amount of energy she brought to the stage was simply amazing. This song has an energy to it that only her songs have, and I really can't think of a better way to start a new series. I wasn't as thrilled with the animation at first, but after watching it a few times I can't think of any other visuals to go with this song. 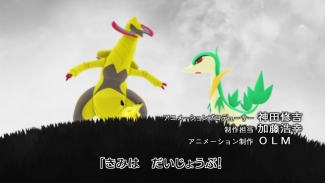 The animation doesn't do anything we hadn't seen before - we had CGI in Nyasu no Party, and the "revealing things as they appear" thing was done back in Battle Frontier and Spurt! - but it does manage to compliment the song despite the lack of human characters on screen. The fact that OLM is now able to produce high quality CG models that feel like living creatures is just an added bonus. The English song can't even come close to touching the awesomeness of the Japanese song. But, I still kind of like it, sort of. They found a way to fit the words "black and white" into the lyrics without making it sound overly hokey, and I liked the fact that the editing was done in such a way that it wasn't super obvious that the original video this footage was taken from was almost three times as long. I'm not overly thrilled with the shoehorning of the word "Pokémon" at the end and the song could stand to be longer, but I do think this is one of TPCI's stronger efforts. The lyrics on the left are my translation of Best Wishes! The original Japanese lyrics can be found here. The lyrics to the English theme song are on the right. Cuz you've got the power inside of you. The lyrics to Best Wishes! try their best to convey the sense of "newness" seen in the Isshu region. There's a lot of talk about the first this and a new that before it starts talking about the desire to receive help from a faraway place. Some of the lyrics are kind of weird - "a voice from the future" comes to mind - but overall, it has a nice message of "everything's going to be OK."
The song used in the dub, which I'm calling "Black & White" for now because I don't know what else to call it (hope it hasn't already been taken! ), seems to have more of a "be strong and independent" vibe to it. The references to other people, like the "familiar voice," are done away with in favor of a "follow your heart" sort of thing. On the flip side, the English version talks about all these hardships one has when starting a new journey while the Japanese version does not. The dub opening is a duet sung by a male singer and a female singer. This is kind of like what happened with High Touch! where Satoshi and Hikari sang the song together, but the main difference here, of course, is that both the singers in that Japanese song were female. In this version, one voice is clearly male while the other is clearly female. I wish the singing duties had been divided more evenly (the male singer only gets two lines), but I blame the song's short runtime more than anything else. The English dub more or less translates the credits as shown in the Japanese opening, with the usual omissions. Missing is the opening text about Satoshi's adventures, the information about the franchise's publication, the involvement of TV-Tokyo Music and East Japan Marketing and Communications, Inc., and the data about the opening theme. 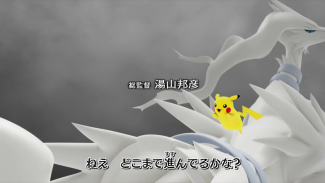 A credit for Executive Animation Director is given to Toshiya Yamada and Tosihito Hirooka in the English opening when no such credit is present in the Japanese version. The opening theme to the American version clocks in at a paltry 30 seconds, making it the shortest English opening theme yet. Obviously, massive cuts had to be made in order to fit everything in. Pikachu is seen running along the planet-like surface. Kibago and, way in the distance, Shikikija. A closer look of Shikikija. 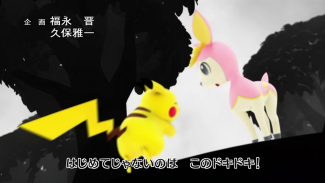 The scene suddenly cuts to a shot of Pikachu running along Zekrom's tail. 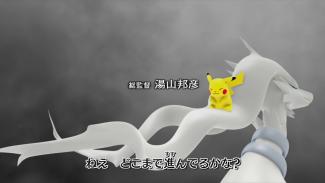 Pikachu slides down Reshiram's wispy mane. It starts to run along Reshiram's back before jumping off and flying through the air. Back on land, Pikachu runs past Chillarmy. 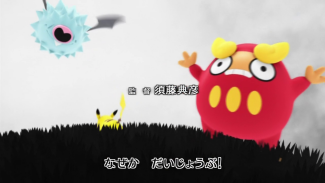 The shot featuring the starter pokemon also features a Hatohboh flying past. The dub also cuts out Futachimaru's and Mamanbou's appearance. 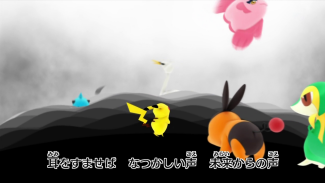 The majority of the pokemon in the Japanese opening got removed, which is a real shame. We got to see all these great close-ups in the Japanese version barely get to see any of them in the dub. The dub resists the urge to insert any episode clips for the second time in a row. This is a very good thing since the mixture of hand drawn animation with CGI would have looked absolutely terrible. It's too early to tell if this whole "add episode clips into an opening" practice is a thing of the past, but I'm cautiously optimistic that it is. 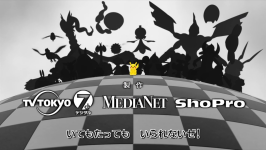 In Japan, the opening theme originally aired with all the Isshu pokemon being covered in silhouettes. 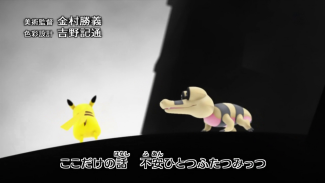 When a new pokemon made its debut in the TV series, its silhouette would be unveiled and the pokemon's full color model became visible. 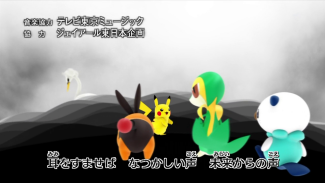 By the time the fourteenth episode came around, all the pokemon that had been covered in shadows was fully revealed. 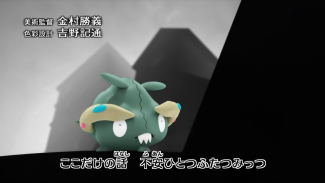 The English version, predictably, uses the version of the opening where all the pokemon are fully revealed. I say "predictably" because it did the same thing with Battle Frontier, Spurt!, and Together; they used one version of the animation and didn't bother to update it for the duration of its run. 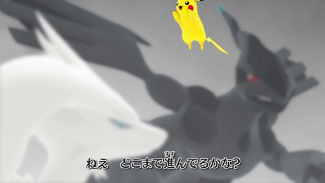 Another difference is the fact that the scene featuring Pikachu, Zekrom, and Reshiram was flipped for the English version. 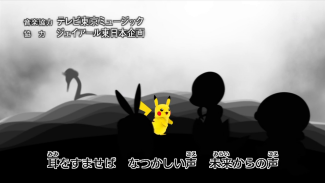 This was likely done to help ease the transition from the scene the dub places in front of it (a shot of Pikachu walking from left to right) to this flying scene. The opening ends on a rather aggravating note, unfortunately. 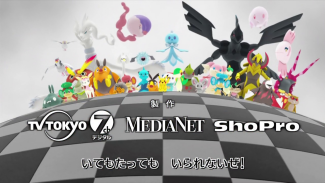 TPCI thoughtlessly places the show's logo in the center of the screen, completely blocking out the majority of the pokemon including Pikachu and the starters. Why didn't they put it in the same place the Japanese version put their "Executive Production" credits? 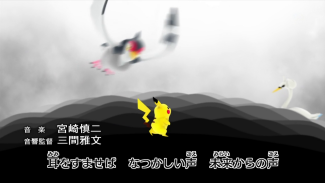 The opening theme to DP Sinnoh League Victors also placed the show's logo over the final shot used in its Japanese opening, but it wasn't nearly as bad since they actually had the sense to place it in the empty space that time. This...this is just brainless. Song-wise, TPCI's newest opening is so-so. Video-wise, it's probably the best we could have hoped for given all the things working against it. The fact that this is the shortest opening yet does make me worried that they're going to keep getting shorter and shorter until, one day, they're phased out completely. TPCI is only just now getting the hang of editing the footage together to make a decent opening; I'd hate to see them stop now.